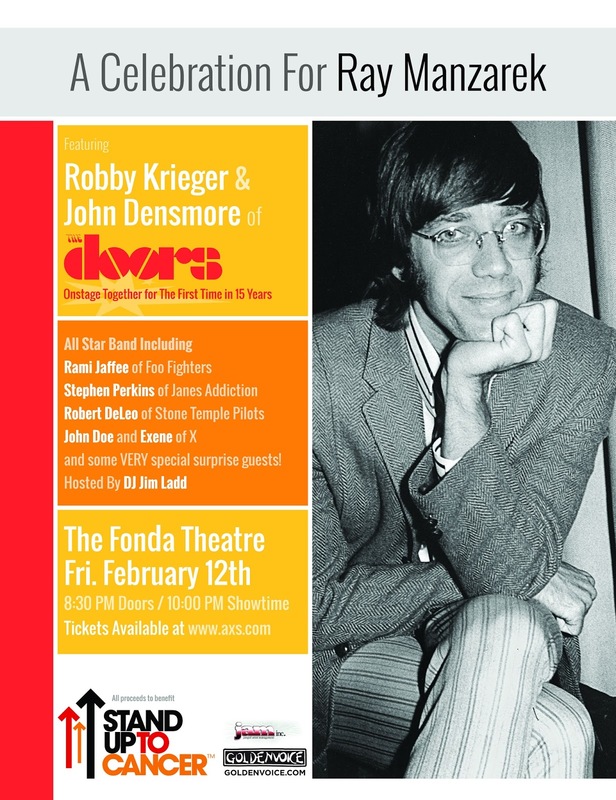 Surviving members of The Doors – guitarist Robbie Kreiger and drummer John Densmore – reunited in Los Angles on February 12 for a performance tribute to their late bandmate Ray Manzarek. 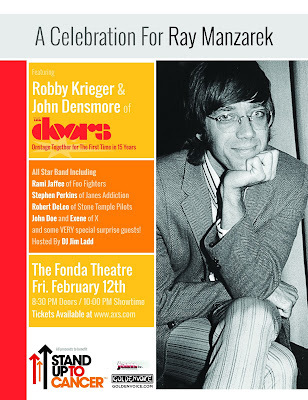 Billed as “A Celebration For Ray Manzarek”, the show at the Fonda Theatre took place on what would have been the keyboardist’s 77th birthday; he passed away from bile duct cancer in Rosenheim, Germany in 2013 at the age of 74. With all proceeds from the event going to benefit Stand Up To Cancer, Friday’s concert saw Krieger and Densmore joined by a cast of guests including Taylor Hawkins of the Foo Fighters, Warren Haynes of Gov’t Mule, Exene Cervenka and John Doe of X, Annika Rose of Breaking 27, Rami Jaffee, Robert DeLeo of Stone Temple Pilots, Krieger’s son Wayne, and Jane’s Addiction drummer Stephen Perkins, among others. “A Celebration For Ray Manzarek” marked the first time Krieger and Densmore shared the stage together in over 15 years.